Walk behind waterfalls on this triple waterfall hike! Perfect for the summer this hike features three different waterfalls, in one awesome trail. 4.4 miles total this is a great way to get some energy out of the kids! This is a quintessential western Gorge hike - 3 sparkling waterfalls (one in which you get to walk behind! ), several outstanding Gorge views, and one unique Oneonta Gorge slot canyon all packed in 2.2 miles (one way)! 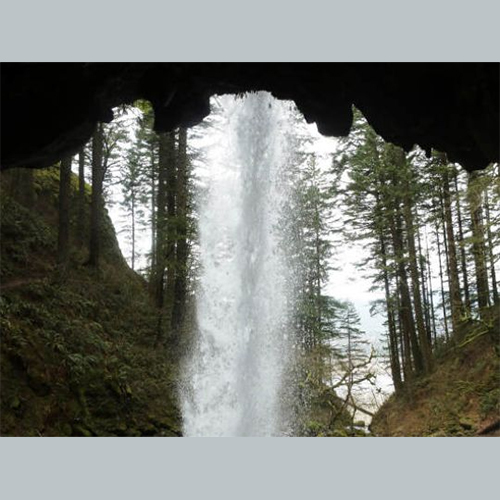 Begin the hike next to 176-ft Horsetail Falls and climb along a mossy slope of ferns. At .2 miles, turn right onto the Gorge Trail taking you to 80-ft Ponytail Falls in which you get to walk behind! Linger here to enjoy the dancing of the falls' spray. Beyond the falls in .4 miles you'll come to several trails to the right. They lead to several outstanding viewpoints at the cliffs edge, high above the river. Be careful to not get to close to the edge. Continue on the main trail another .4 miles, crossing over a metal footbridge above 60-ft Oneonta Falls. Quickly you'll arrive at a junction with the Oneonta Trail. Turn left here to Triple Falls, .9 miles up the trail, making for a perfect lunch spot. Turn around and head back the way you came to complete this out-and-back 4.4 mile hike.